The big courtyard apartment offers two rooms and a kitchen, plus a hall with separate entrances to the shower room and the toilet. You enter the apartment from the cobbled patio, where you arrive in the big living room with two seperate regular beds plus a sofa-bed for two persons. The dining area is also in the living room, which is equipped with TV, DVD and a bookshelf full of books, magazines and parlour games for rainy days. 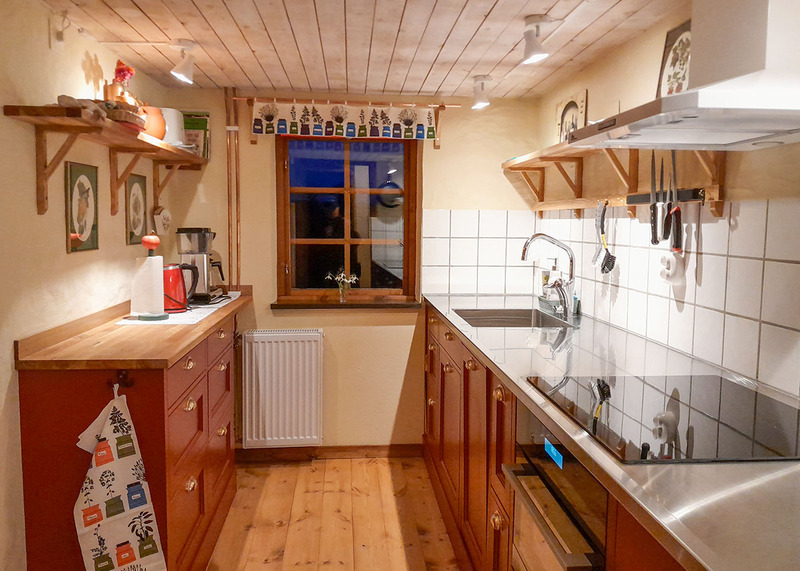 The kitchen is fully equipped with stove, oven, microwave, fridge-freezer, coffee machine and an electric kettle. Beside the kitchen is a smaller bedroom with two seperate regular beds. There are outdoor furniture and a barbecue grill on the cobbled patio. You also have access to a laundry machine and tumble-drier. The accommodation is equipped for self-catering, so you only need to bring bedding, towels and food. Breakfast can be arranged. Pets are welcome in the courtyards apartments. N.B. No smoking indoors! During peak season we rent weekly (Saturday to Saturday) only. Check in at 15.00 hours and check out at 12.00 noon (or according to agreement). We do not accept credit cards, but there is an ATM in the village. The livingroom in the big courtyard apartment. The living room is big and houses two beds, sofa-bed for two and dining table. Bedroom with two of the four beds in the big courtyard appartment. 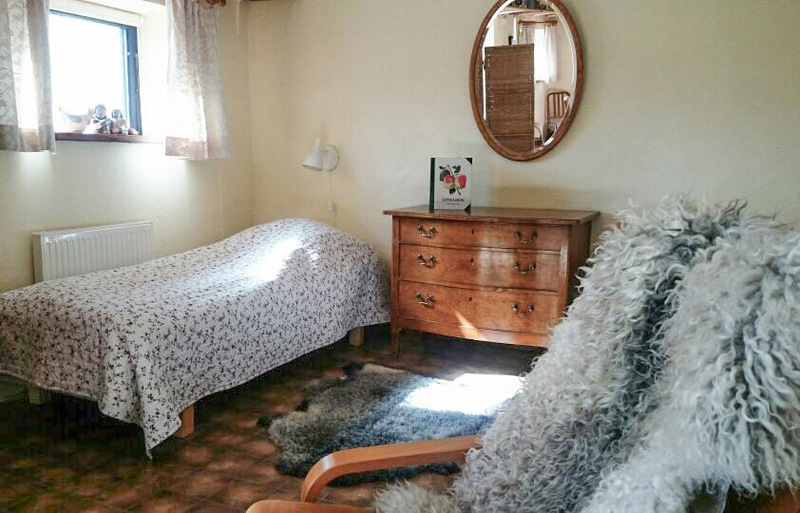 The kitchen in the big courtyard apartment is facing the apple orchard and is fully equipped for self-catering. In addition to the small dining table in the kitchen there is a larger dining table in the living room. There are table, chairs and bbq-grill in the old cobblestone patio. 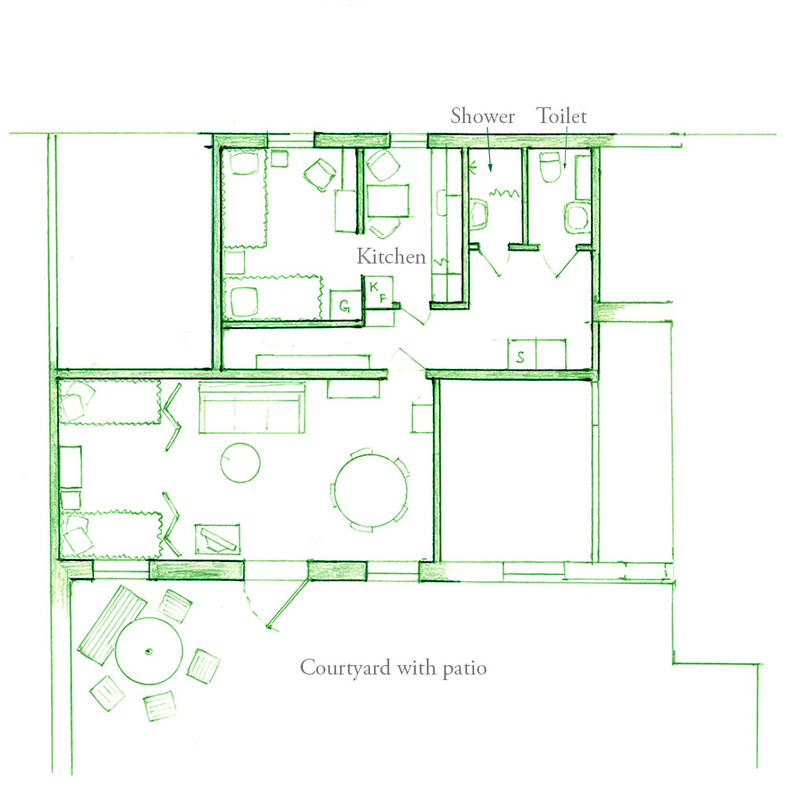 Interior planning for the big courtyard apartment.